Polaroid 3-32-LED-14 review | What Hi-Fi? Polaroid is quickly becoming hot on our bargain TV brand list. After its dirt-cheap 42in 5-42-LED-14 swooped out of a packed test with four stars – exceeding expectations on all counts – the instant-film camera company returns here to repeat history with its 32in HD Ready set. At a cuddly £200 (Polaroid TVs are sold exclusively at ASDA supermarkets in the UK), it’s easy to match up against the Finlux 32H8075-T (£200), though similarities don’t end with price. The familiar gold-on-black horizontal strip menu we’ve seen on Finlux sets features here, in addition to a blue single-page portal where you can access the usual online services (BBC iPlayer, Netflix and YouTube); your social media (Facebook and Twitter) accounts; and an ‘app market’, which houses a few handfuls of free downloadable apps, too. Your £200 doesn’t bring you the flashier interfaces of pricier rivals, but it gets the important things right: simplicity and ease of use. Tabs and apps are coherently spaced-out and clearly labelled. If you’re new to Smart TVs, this is a good place to start. The remote, which is also a carbon copy of the Finlux's tall, chunky design (minus the brand logo, of course), is responsive and prompt. A supplied USB dongle grants the Polaroid wi-fi by simply plugging it in, though a LAN input allows for a wired connection via an ethernet cable too. Three HDMI, two USB, a scart and PC inputs are also onboard, as well as a coaxial output and Freeview HD digital tuner. It’s all very well being able to tick the boxes marked ‘features’ and ‘interface’, but picture performance needs to impress. And just like Polaroid’s 5-42-LED-14, it does. Load up the latest Jean-Claude Van Damme-starring action thriller Enemies Close on Blu-ray and the picture is crisp and clear as we enter the film’s wooded setting. Cabin floorboards are sharply outlined and details in the panels’ varying patterns are laid bare. Colours appear strong and punchy, too, as the greens of the forest and reds of the drug cartel’s jackets litter the screen. Inevitably, hues aren’t as deep or rich as those produced on the best (around twice the price) sets, but we’re fans of the Polaroid’s convincing delivery and even tone. Fresh from the box, there’s a slight issue with factory settings that cause unwanted glare on faces. Run the telly through a THX Optimiser test – fine-tuning brightness and contrast along the way – and that dies down nicely. As a result, contrast is good. Night-time backgrounds are appropriately pitch black, while whites have pop - though nuances in shades are often soft-pedalled. The Polaroid misses the Finlux’s natural-looking picture warmth, so skin can look a little brazen at times. We’d keep colour temperature to ‘Normal’, though, as ‘Warm’ adds an unnatural sandy overlay, and ‘Cool’ accentuates its inherent paleness. Motion isn’t an issue, mind: forest flights are two a penny in the film, and the set stays blur-free with trees in the backdrop keeping a solid outline. And as the pursuit continues into the dead of night, the Polaroid successfully scrambles after detail and clarity. Switch to broadcast programming and the set’s Freeview HD tuner livens up daytime TV with bright, vivid colours. Naturalness is forsaken for a slightly overcooked delivery, though the picture’s punch, sharpness and detail make it a satisfying watch – even with standard-definition programmes. In typical flatscreen fashion, sound is relatively thin and hard. Having relatively little weight behind it, it doesn’t do justice to action sound effects, though it gets away with more uneventful daytime viewing. Dialogue is clear and volume can hit some height. Although the cheapest of soundbars will add body and volume, you’re talking another £150-200 to get your hands on one. The 3-32-LED-14 might not have the most fetching design out there – its black plastic bezel is meatier-than-most and its *cm-deep frame not as slimline as some – but we can’t fault its sturdy build. It sits rigidly on the four-spoke stand, which keeps nicely tucked close to the unit for convenient placement on a tabletop. 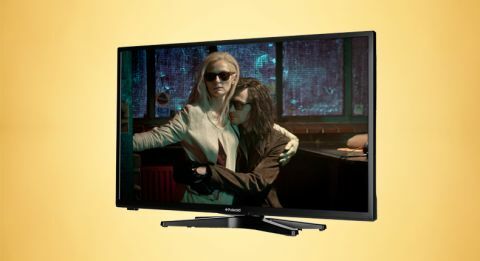 We still feel lucky to get 32in Smart tellies for just £200, but when they have a decent picture to boot, the great-value incentive really hits home. This Polaroid is one of those standout sets and, though its sound and design are rather less inspiring than its picture, it’s certainly worth boot space among your weekly groceries.